A three percent drop between 2016 and 2017. The United States fertility rate is now at an all-time low in the country’s history, dropping by half of what the fertility rate was in the 1950s. The latest Center for Disease Control (CDC) data reveals that the U.S. general fertility rate — the number of births per 1,000 females aged 15 to 44-years-old — has dropped to a record low of 60.3 births, a three percent drop between 2016 and 2017. 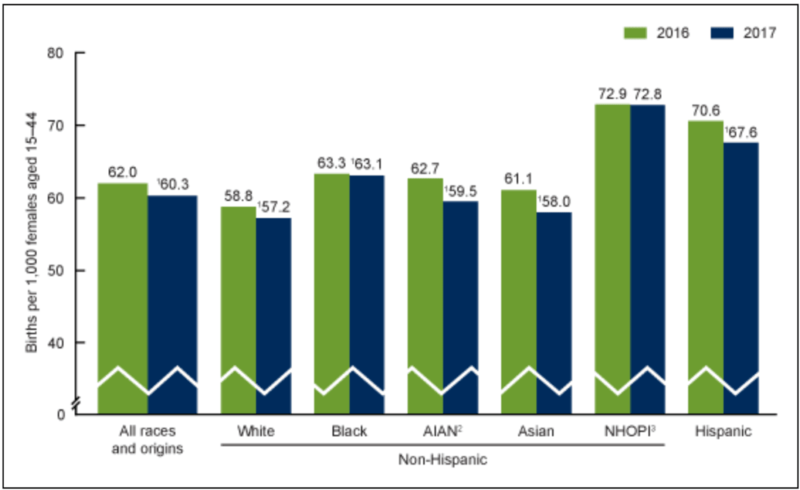 The fertility rate dropped for every racial demographic group, with non-Hispanic Asians’ fertility rate dropping the most out of any racial group. The fertility rate among Hispanics dropped by four percent, while there was a three percent drop for non-Hispanic whites. This record low fertility rate is half of what the fertility rate was in 1958 when there were a little more than 120 births per 1,000 females aged 15 to 44-years-old.